The chase was on. Weeds high, the ground a sloshy mud. And it was hot. “They are still going eastbound,” a pursuing border agent observed. He is one of several Border Patrol officers who chased a group that had just illegally crossed the United States border from Mexico. 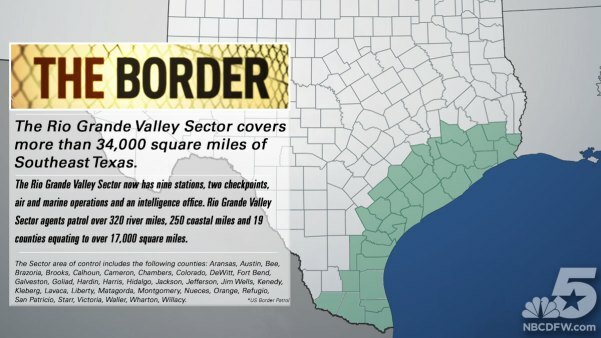 It is an area south of McAllen that is so well-traveled by undocumented immigrants that it leads the nation in Border Patrol apprehensions and prompted President Donald Trump to send National Guard troops to help out. It may only be a temporary fix, though, for the challenges facing the Border Patrol. On this day, NBC 5 Investigates went along to observe. After five people were caught, another one was spotted. He tried to escape — unsuccessfully. The six detainees – four women, two men – are from Mexico, El Salvador and Ecuador, all tired and thirsty as they sat in the weeds. Some were in tears because their mad dash into the U.S. failed. Over the past year, more than 137,000 undocumented immigrants were caught along this 300-mile stretch, the “RGV,” representing about 40 percent of all such apprehensions along the southern border. The Rio Grand Valley Sector, as defined by US Customs and Border Protection. See a larger version of this image here. “This is the last stand,” said Manuel Padilla, sector chief for the Border Patrol. Padilla told NBC 5 Investigates that his team is fighting to keep up, especially with the increasing number of children and whole families who require greater needs, and trigger more paperwork, when caught. In addition, he said, “stash houses” are found almost daily – places where undocumented immigrants hide in horrid conditions, sometimes stolen, like cargo, by rival smugglers. “So these things are what I call symptoms of a border that needs a lot of work. Those are the things that keep me up at night,” Padilla said. The Border Patrol is also fighting a staffing battle, losing agents faster than their replacements can be hired. In the RGV, the patrol is short 90 agents, while nationwide there are more than 2,000 vacancies. He said he hopes relief will come from the hundreds of National Guard troops recently sent to the RGV. They will work behind the scenes providing support services, freeing up Border Patrol agents to return to the front lines. It’s not the first time National Guard troops have been sent to the border to help out. In 2014, then-Gov. Rick Perry dispatched troops to back up Border Patrol agents. But there are differences this time, such as the current deployment being ordered by the White House, with a better understanding that the Border Patrol remains the lead agency in the mission. Still, “it remains a challenge,” said Ralph Basham, head of the U.S. Border Patrol under President George W. Bush. “The National Guard deployment is good for the short term, but it’s not a long-term solution,” Basham said. One of the biggest reasons, he said, is that the National Guard lacks the authority to make an arrest – an essential tool when chasing someone on the run. “The solution is really to hire enough agents,” Basham added. Until then, Border Patrol agents said they will do all they can with what they’ve got. That happened when NBC 5 Investigates went along for the ride. 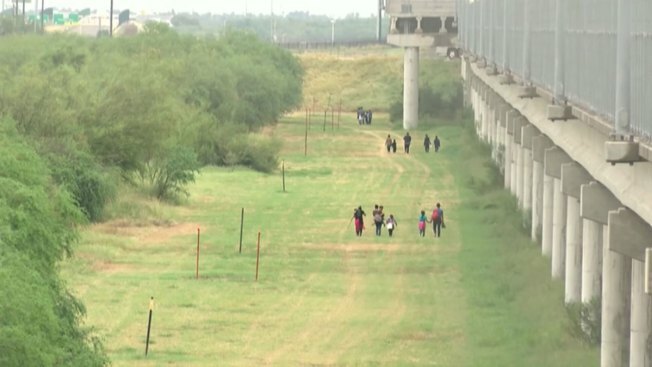 On that morning alone, with just a handful of agents on patrol, more than 25 people were caught as they attempted to enter the country illegally.